The Bronx Zoo, like many public facilities, has long had internal protocols for both standard operating procedures and emergency operating procedures [EOPs]. In the early 1970s, the Bronx Zoo’s newly-revitalized Safety Committee conducted a series of revisions of the Zoo’s Emergency Procedures Manual. The revision process included gathering and codifying types of emergencies, ideal responses, and needed equipment from a wide variety of departments. 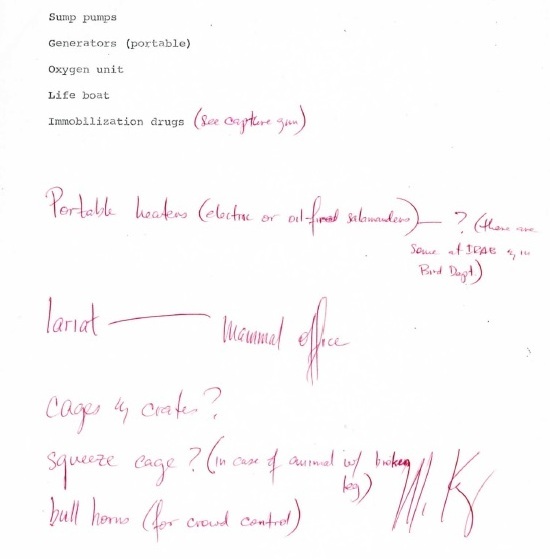 Detail of the reply from Herpetology Department Curator Wayne King to a May 1972 request from the Safety Committee for additions to the emergency equipment list. Scanned from WCS Collection 2010/Safety Committee. One interesting EOP included protocols for venomous snake bites that occurred outside of the Zoo. In those days, the Zoo often fielded telephone calls from hospitals that were treating snake bites and lacked expertise in snake identification and anti-venin matching. In these cases, the Zoo’s Reptile Department would get the description of the snake from the hospitals and send them doses of the correct anti-venin via the police. 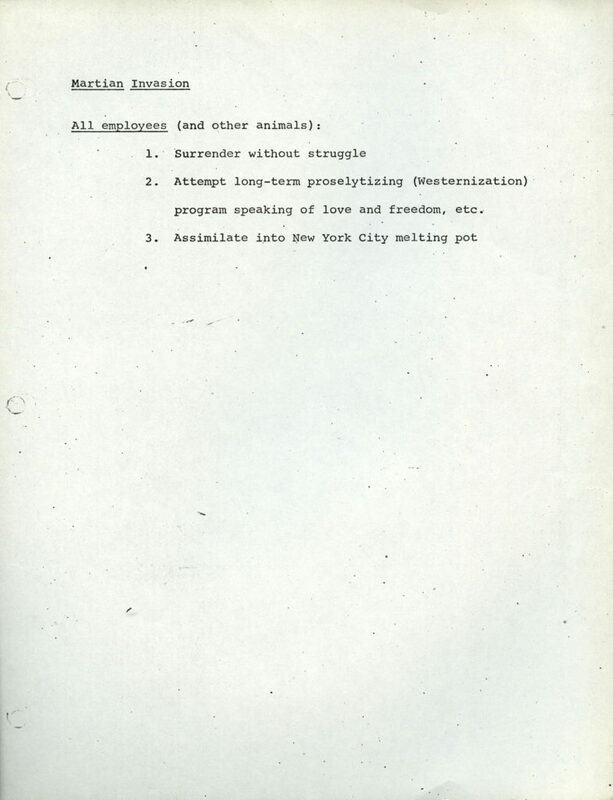 Last page of the Bronx Zoo’s 1974 draft Emergency Procedures Manual, describing protocol for a Martian attack. Scanned from WCS Collection 2010/Safety Committee. An administration with a sense of humor! Way to go, BZ!